Var. shots of gas station and pumps. CU counter on pump ticking as guy fills his tank. MS standing behind his car filling tank. Credit card swiper with Exxon imprint. Sign: Exxon: .49 (per gallon) SAVE Self Serve. TLS FINA gas station sign, gas price signs: .52, .54, and .56 / gallon. CU gas nozzle in tank. Gas pump meters running - sale, gallons, price per gallon. Shell gas tanker truck and driver. Some CUs of the truck's pumps, hoses etc. TLSsign: Free Car Wash with Fill Up"
Dallas TV News reporter George Fields gives report on gas shortages and surges in price. he stands at gas station pump. Various CU's of pumps, dials turning as gas is pumped into tank, at CU of a Mobil gas pump. WS reporter (George Fields) stands with the mic in his hand at gas station. Pums and station in b/g. "The energy crisis has developed into a money crisis." Zoom into Mobil gas pump labeled "Regular". He talks about the boost in the price per gallon and how hard it is on gas station operators. Says that some operators claim they will be out of business soon. Cuts back to MS of Fields talking to camera with microphone in hand. Stationary camera as cars move along the highway. Good example of your typical 1970's gas guzzlers, vans and Volkswagen beetles. POV shot from slow moving vehicle approaching an exit ramp. Camera passes a sign that reads "EXIT 30 MPH". Stationary elevated shot of cars moving along the highway. Shot of signs that read "SPEED LIMIT 60" & "TRUCKS 50". Reporter Norm Wagy is on location in Washington DC, the Capitol Building is in the background. The topic of discussion is the fuel shortage. Wagy states that the shortage will be studied by both houses. He goes on to say that the interior department is considering a speed limit reduction for american highways. Changing the speed limit from 70 mph to 60 mph is expected to reduce gasoline consumption by 11%. It is thought that the savings could reduce the chance of a summertime shortage. The Senate Consumer Subcommittee will open hearings on the subject. "Meanwhile...." a congressman has charged that domestic producers were exporting 200,000 barrels of oil during last winter's shortage. Another congressman has called for the cancellation of the Indianapolis 500 in order to conserve gasoline. The suggestion is being written off. 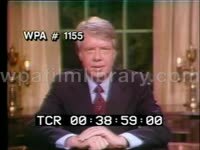 A Caucasian man is seated behind a desk talking to a reporter. The man explains an expected increase in gasoline prices, reporter jots down notes. 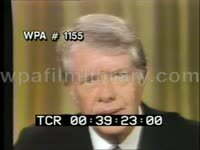 Man begins by saying "Crude oil from the Middle Eastern states comes here. We're paying more for it, that has to be translated into cents per gallon at the service station". Reporter states that premium gas prices are already being sold at .47 cents a gallon. Reporter asks if it will go up to .50 cents. Man responds "probably" next spring. Man then states that the majority of the gas being consumed is of the regular quality, this is because of polution and emission controls. "So you'll see gasoline at that level .44-.45 cents per gallion." MS group of young Muslim men chanting, shaking fists in air. U.S. Gas/Oil Shortage: B&W MS of car at pump, sign in FG reads "Sorry! No More Gas Today." Color MS sign propped up against garbage can reading ""Sorry No More Gas Today." MS sign posted in gas station window reading "Sorry Temporarily Out of Gasoline! Service Bays Open." MS pre-Iranian Revolution leader SHAH OF IRAN (Mohammed Reza Pahlavi) and his wife EMPERESS FARAH DIBA posing for press on hill overlooking sea. TLS crowd of anti-Shah protesters in Iran. Elevated TLS of early 1970's traffic moving along the highway, filmed from overpass. POV driving along highway, showing traffic from a moving car. Office Interior: MS/CU of middle-aged Caucasian man being interviewed by an off screen reporter. Man talks about driving during the Labor Day weekend. Man states that drivers will have difficulty finding a gas station open on Sunday. He goes on to say that earlier that year the situation was fuel supply shortage, now it is the organized closing of stations by the gasoline retailers. Gas shortage, gas crisis. Cocked angle MS advertised gas prices for Fire Chief, Low-lead and Sky Chief gasoline at gas station, respectively 41 cents, 43 cents, & 45 cents per gallon. MS rotating Shell sign at Shell gas station. MS Fas Gas sign, 40 cents per gallon. Traveling shot Fas Gas gas station, gas pumps. TLS clutter of gas station signs for Mobil & Gulf. MS Dixie Vim sign, advertised gas prices of 50 cents for regular & 52 for ethyl. MS road sign outside gas station: "Prices for Economy Minded People." Low angle MS Dixie Vim gas station sign, gas prices. Low angle MS Mobil gas station sign. MS "Self-Serve 50 cents" sign. Brief traveling shot gas pumps. Low angle MS "You Serve Yourself, 44 cents" sign outside gas station. MS Mobil sign, Exxon sign in near BG. TLS ARCO sign. TLS Phillips 66 sign. TLS Texaco sign. Master 1942 Part 2 CU Texas license plate with sticker from '79. CU fueling of car with pump in gas tank. MS man standing outside of his huge blue car smiling. CU Texas license plate with '80 sticker. GV long haired men filling up cars at gas station. CU Texas license plate. GV man filling car at station. CU Texas plate. MS reporter Jim McDaniel leaning against gas pump while he talks into microphone. He talks about the Governor s "No Tie Summer". Master 1909 Part 1 GV gas station with 'Pumps Closed' sign posted, a van is parked near pump. GV pea-green Dodge Challenger pulling up to pump. MS African American man wearing red baseball cap seated next to car. CU 'Exxon' pump with counters at zero. GV pumps with 'Pumps Closed' sign posted. GV cars riding along highway. MS/CU man behind desk talking about gasoline and the car population in Texas. CU profile man with bad haircut. MS gas station attendant taking cash from driver of car (money exchanging hands). CU gas pump counting gallons and price. GV as black Pontiac Catalina pulls up to gas pump. GV traffic moving along highway. GV cars lined up at gas station, regular gas is $.75 per gallon. MS as service attendant hands driver of station wagon a clipboard to sign for payment. MS gas pump, numbers rolling. MS white man wearing green & white jogging suit at grocery store checkout, African-American woman placing groceries in bag, CU man fiddling w/ cash in wallet. MSs employees ordering at McDonald's restaurant, employees taking orders, pushing large stryofoam containers of food through pass window, shoveling french fries into containers. 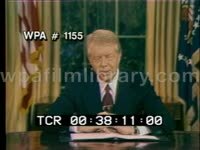 MS President Carter speaking at press conference, 1979, saying that there are no easy answers to surmount inflation, that it affects every nation on earth. Low angle TLS metal derrick horse pumping oil in oil field. MS tractor shovel hauling coal in open pit coal mine. 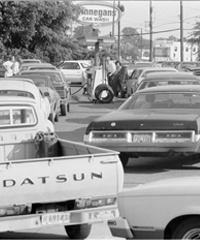 1979 Oil/Gas Shortage: LS gas station on a rainy day, people move about; MS group of men standing around w/gas cans waiting to fill up; TLS people pushing car that ran out of gas; MS/GV lines of cars waiting at station; MSs employee turning people away after running out of gas. Gas Lines - Energy Crisis Montage CU sign reading "Sorry No Gas - Service Dept Open". CU sign reading "Odd Nos. Only". CU hand written sign reading "$3.00 Limit". MCU gas pump with gallon & price count rolling, man seen behind pump, crouched while filling tank located behind rear license plate. MCU box placed over pump, hand written message reads "No More Today". MCU young man sleeping at wheel of car, head tilted back out the window, pan to TLS showing an insane amount of cars lined up waiting to get gas. TLS street showing line of cars waiting for gas to the RT, cars pass on the LT, gas station employee stands in street directing traffic flow, telling people no more gas available. MCU young couple in car, pan out to show the line begin to move. Texaco station with pumps announcing a trial of Gasohol. Good shot of old pre-digital number wheel gas pump with wheels turning to total up a sale. Long lines at a gas station. People filling their cars. People filling cars at a Gulf station, with lots of vintage Detroit heavy iron cars. Cars at a gas station. Bill Brooks, Gas Station Owner says that he owns his station so the oil company can't dictate his policies, but most other station operators just lease a franchise, so they might have more trouble selling Gasohol or using independent wholesalers. Car filling up at gas station. Mobil and Exxon and other gas station signs and logos. Mo Campbell, Gasohol marketer says that the big oil companies are trying to lock out Gasohol at every level of the game. Mobil Oil rounded gas pumps. V.O.-MOBIL considers its pump shape a proprietary trademark, so dealers who want to sell Gasohol have to buy a conversion kit to change the shape of the pump at cost of $400. Texaco pumps in gas station with Gasohol signs, Texaco being the only major oil company to market its own brand of Gasohol. Number wheels on gas pump.